In 2008, Rick Lyke, a veteran beer and wine journalist, was diagnosed with prostate cancer after a friend who was recently diagnosed with it urged him to get tested. 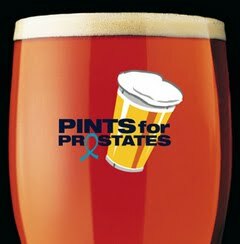 After undergoing treatment, Rick decided to make more men aware of the risk of developing prostate cancer and the simple blood test that can help detect it by using the universal language of beer and formed Pints 4 Prostates. After organizing several small events at bars around the country, he set his sights on something larger and organized the Denver Rare Beer Tasting to take place during the 2009 Great American Beer Festival in Denver. I attened that first event (recap here) and the second one held last year. Now on its way to becoming an annual event during the GABF, the Rare Beer Tasting III is schedule for Friday, Septh 30th from 1:00pm ~ 4:00pm at the Wynkoop Brewery (the same location as the first two). If you plan on attending the GABF, then I highly recommend taking in this event. Not only does the money raised go to a very worthy cause (100 percent of the net proceeds from the sales going to Pints for Prostates), but you will also get the opportunity taste some very rare beers (beers not even available at the GABF) and meet the brewers that created them (list of attending breweries and beers is still being finalized). Tickets are $80 each and go on sale Sunday, June 19th at noon.